The good folks at Orbit Books have something mysterious cooked up, and they'd like you to know all about it. But that's not all! 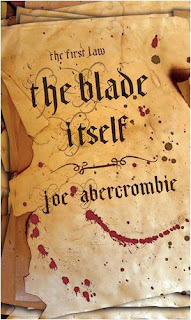 Indeed, they are *so excited* that they are giving away a copy of Joe Abercrombie's classic gritty fantasy novel The Blade Itself to one lucky U.S. or Canadian resident. This is one seriously awesome book, and if you haven't had the chance to read Lord Grimdark yet, it's a great place to start. Enter below to win! This giveaway is open to anyone with a US or Canadian shipping address. The giveaway ends at 12:00am PT on December 9, 2015. We will announce the winner soon thereafter.